We truly are living in the Anthropocene — mankind affects each and every creature on this planet, leaving no corner untouched and no rock unturned. A new study has now shown that human hunting can influence how mother bears care for their cubs, disrupting maternal care strategies. 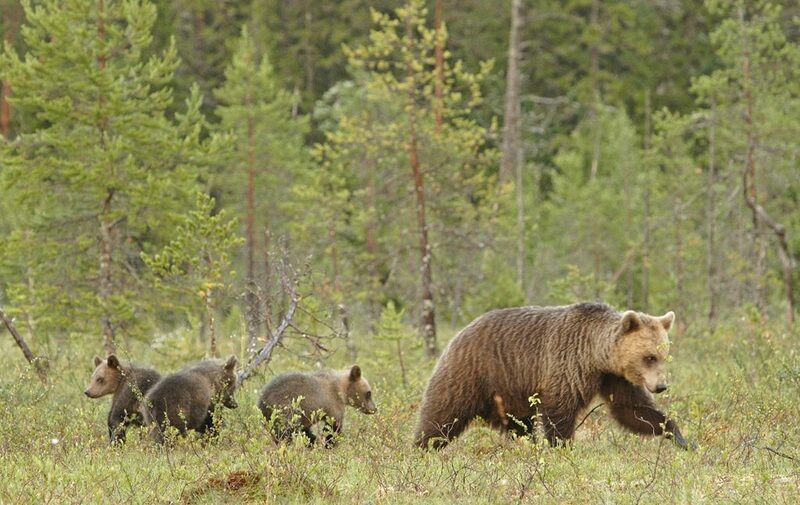 A Scandinavian brown bear family group composed of a female with her dependent cubs. Family groups are protected from hunting by law. Image credits: Ilpo Kojola. “Man is now an evolutionary force in the lives of the bears,” says Professor Jon Swenson from the Norwegian University of Life Sciences (NMBU). He’s not exaggerating either. The brown bear, an emblematic species found across much of northern Eurasia and North America has suffered dearly at the hands of humans. We’ve shrunk their habitats, cut much of their forests, and even hunted them. As it turns out, hunting pressure even changes the mother-cub dynamic. Traditionally, cubs would follow their mother around for about a year and a half. But now, with widespread bear hunting, maternal care has grown to about 2.5 years. Swenson and his colleagues followed bears in Scandinavia for more than 20 years, attempting to understand their ways and coming up with strategies to protect them. “The Scandinavian brown bear project is one of the world’s two longest research projects on bears,” Swenson says, who has been attached to the project almost since its very beginning. Joanie Van de Walle, one of the study’s authors, says that staying together with the cubs is not only beneficial to the cubs — but also to the mothers as well. “In Sweden, it is illegal to kill females and their cubs. Therefore, as long as the female keeps her cubs, she and her cubs will be protected from hunting. Being accompanied by cubs during the hunting season efficiently reduces the probability of being killed. Indeed, adult females that are alone are about 4 times more likely to be killed than females accompanied by their cubs during the hunting season,” Van de Walle told ZME Science. The data shows that both the mother and her cubs increase their survival rates by staying together for an extra year, but it’s not clear if this is a conscious decision or not. “Females could keep their cubs longer for several reasons, for example to compensate for their small size or because this behavior is genetically determined. What we show is that by doing so (regardless of the reason), they survive better,” she adds. At this point, researchers don’t know if this behavior will be passed down to cubs or if it has a genetic basis. But what they did show is that this relatively rare behavior (about 7% before 2005 in south-central Sweden) has since become quite common (more than 30% in recent times). Results are largely owed to how hunting is regulated in Scandinavia, so it’s not clear if similar findings would carry out in other parts of the world. Spending extra time with the cubs means fewer breeding opportunities for the female — but on the other hand, she increases the likelihood of the cubs surviving. It’s an evolutionary game of push and tow, in which man has not become a decisive factor. “In our study, we show that there are two maternal care tactics in the Swedish brown bears. Some females keep their cubs for 1.5 years and other females keep their cubs for 2.5 years. Using either one of the two maternal care tactics yields very contrasted survival and reproductive rates and these differences appear to annul one another, with both tactics being apparently equivalent. But, as hunting pressure increases, females that keep their cubs longer gain a survival advantage that outpaces the cost in reproduction and the best tactic should be to provide 2.5 years of maternal care. Our results, therefore, show that hunting has the power to drive female reproductive behaviors,” van de Walle told ZME Science. At this point, it’s hard to say if hunting policy should be changed or not. It’s unclear how a shift would affect brown bear population — but what is clear is that we are responsible for changing their behavior. Human action always has consequences on the natural world, and quite often, those consequences are unexpected and hard to anticipate. “At this stage, the consequences on the dynamics of the population of a change in female brown bears reproductive behavior are hard to anticipate and it would be difficult for us to say whether the policies should be changed or not. One of our goals with this study was to document how humans, through their harvest and actions, can have unexpected consequences on the wildlife populations they are trying to manage,” van de Walle concludes. Journal Reference: Joanie Van de Walle, Gabriel Pigeon, Andreas Zedrosser, Jon E. Swenson & Fanie Pelletier. Hunting regulation favors slow life histories in a large carnivore. DOI: 10.1038/s41467-018-03506-3.